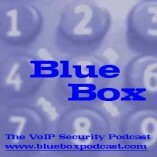 Blue Box: The VoIP Security Podcast: Welcome to Blue Box: The VoIP Security Podcast! Welcome to Blue Box: The VoIP Security Podcast! Greetings! Welcome to our little corner of the online world where, from 2005-2008, once a week (roughly) we got together to have a conversation about Voice-over-IP (VoIP) security. As you look down the page, you'll see that we have two general types of shows. Our "main" shows are where we get together and discuss the latest VoIP security news, offer commentary on topical issues and play and respond to listener comments. These shows have been numbered consecutively since our start in October 2005 and generally run about 45 minutes. Our "Special Edition" podcasts (now designated with a "SE" in the show title) are typically special interviews we have done, presentations we have given or panels/presentations from conferences that we have been able to record. They are quite diverse and so do vary widely in length. As you'll notice in our main shows, we've developed a wonderful community of listeners and always welcome comments, contributions or other feedback. Thank you for visiting and we hope you enjoy the shows. Please do send us your thoughts and comments.